Successfully Added Waterproof 4K Sports Camera - IP68, 4K Resolution, 150-Degree View, 2-Inch Display, 30FPS, Anti Shake, App Support, WiFi, 800mAh to your Shopping Cart. With this incredible 4K sports camera you’ll be able to capture all your upcoming outdoor adventures in ultra-HD 4K resolution. The action camera supports WiFi and comes with its own mobile application for Android and iOS smartphones. Thanks to this, you’ll be able to send footage of all these amazing memories instantly to your phone and share them with friends and family back home. Packing an 8MP CMOS sensor and featuring a 150-degree viewing angle, you can be assured that this 4K sports camera captures everything happening around you in mesmerizing detail. At the rear of this 4K action camera, you’ll be able to find a sophisticated 2 Inch LCD display that provides you with an efficient platform on which to look back your previous recordings and ultra-sharp 16MP pictures. The sports camera itself features an IP68 design, meaning it is resistant against water, drops, and dust. Thanks to its tough design you’ll be able to use it during any sporting session in any environment. It even is capable of working underwater in depths of 5 meter without its waterproof shell. Whether you’re into hiking, mountain biking, skiing, or surfing – this beautiful 4K camera will follow you anywhere. Featuring a small yet powerful 800mAh battery, this 4K sports camera is capable of working for up to 1.5h continuously. With so much juice at hand, you’ll be able to capture a days’ worth of fun and excitement without needing to worry about battery life. The action camera furthermore supports a wide range of features such as anti-shake, white balance, cycle recording, time lapse, and loop recording to fully enhance your overall experience. With a 64GB SD card slot in place, you’ll be able to store plenty of your latest recordings without the need to constantly upload them onto your Windows PC or Mac. Coming with different sets of mounts, this 4K sports camera can be easily attached to your helmet and bike without any further hassle. 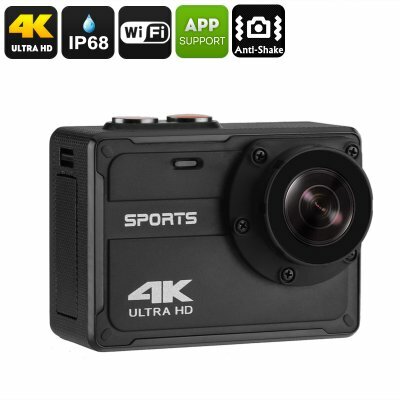 This 4K sports camera comes with a 12 months warranty, brought to you by the leader in electronic devices as well as wholesale electronic gadgets..